Minnesota has a rich transportatiton history and it's bridges have played an important role in the development of the transportation system. This guide provides sources from our library collection and on the web, from books to databases and digital historic materials. General bridge history and resources are found on this page. Resources on the history of specific bridges are found by navigating the tabs at the top. 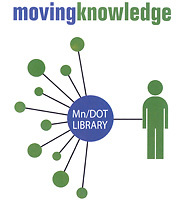 The MnDOT Library provides access to many transportation research databases. Some are available only from PCs logged into MnDOT's internal network (*). Minnesota residents can access some of these resources using their public library card. If you need assistance with any of these resources please contact us at 651-366-3791 or email library.dot@state.mn.us. Academic Search™ Premier contains indexing and abstracts for more than 8,500 journals, with full text for more than 4,600 of those titles. PDF backfiles to 1975 or further are available for well over one hundred journals, and searchable cited references are provided for more than 1,000 titles. This site provides a repository consisting of findings from the evaluation and testing of new and/or proprietary, engineered transportation products. ITS Decision is explicitly organized to highlight the interdependence of different ITS technologies and topics by extensive interlinking throughout the site allowing the reader to quickly assess the relationship between different ITS technologies and topics. Research reports resulting from research administered by the MnDOT Research Services Section. The National Transportation Library is a repository of materials from public and private organizations around the country. The Library is intended to facilitate the exchange of information related to transportation. The Transportation Library's staff produce NUTranLit, a web based periodical index of transportation and law enforcement articles and conference proceedings. PATH is a multi-disciplinary program with staff, faculty and students from universities statewide, and cooperative projects with private industry, state and local agencies, and non-profit institutions. The TRB RiP database contains about 2,000 records of research projects sponsored by the departments of transportation in the fifty states. TRB Technical Activities standing committees identify, develop, and disseminate research need statements (RNS) for use by practitioners, researchers, and others. The RNS on this website have been developed by the technical committees. The TRB Publications Index contains over 41,000 papers, articles, and reports published by the Transportation Research Board, Highway Research Board, Strategic Highway Research Program, or the Marine Board from 1923 to date. TRID is integrated database that combines the records from TRB's Transportation Research Information Services (TRIS) Database and t International Transport Research Documentation (ITRD) Database. TRID provides access to over 900,000 records of transportation research worldwide. The Database allows customers to access DOT publications that are available online. The preservation of historic bridges in Minnesota : a strategic plan by Minnesota. Department of Transportation.